With a dozen or more separate utilities required to inspect the ground under the dig site for a welter of obstructions like water, sewer and gas pipes, electric lines and electric generators – some so old they don’t appear on city maps – the permitting process can take 18 months or more. Transformational new technology being developed jointly by the University of Vermont and the University of Tennessee at Chattanooga could reduce the inspection process to an afternoon’s work. The project’s goal is bold, said Dryver Huston, a mechanical engineering professor at the University of Vermont, and the project’s principal investigator. When the technology is fully developed, “a person with augmented reality goggles or a specially equipped smart phone or tablet will be able to walk over the area that needs to be inspected, look into the device and see in detail what’s underground six to 12 feet down,” he said. The project, which Huston describes as “cognitive” ground penetrating radar, has two major components. At the University of Vermont, researchers – including electrical engineering professor Tian Xia, Huston’s UVM collaborator – are refining an advanced ground penetrating radar, or GPR, system Huston developed that can peer deep underground to detect buried infrastructure, some of it dating to the mid-19th century, and create scans of what it sees. “The net result is that the system knows where you are, knows what’s underneath, and can show you detailed images of what’s there,” Huston said. In its other major component, researchers at the University of Tennessee Chattanooga, led by Dalei Wu, an assistant professor of Computer Science and Engineering, are developing an edge computing platform that will enable the huge amount of data generated by the UVM team’s technology package to be processed near the data collection site – at its “edge” – so it can be quickly relayed back to the radar operator in real time as the area is being mapped – or, later, to utility or construction workers who are walking the site to see what lies underneath. Wu’s team is also developing an encryption system that will keep the infrastructure data secure as it flows back and forth, addressing a key concern of safety and law enforcement officials. After working on technical development for three years, Huston and his team have spent the last six months “ground-truthing” the radar scans and the associated technology on the University of Vermont campus and in the neighboring town of Winooski, with Burlington scheduled for the spring. In partnership with the university’s physical plant team and city workers in Winooski, Huston and his team took scans of underground infrastructure at dig sites before the work took place, then compared what the GPR showed with what was actually there. “It checked out,” Huston said. Wu’s team was able to transfer the huge amount of data generate by the GPR and the 3-D scanning software from a street near the university back to a server on the campus in real time, a technical challenge of the highest order, Wu said. He is also making headway in developing encryption systems. "We paved the way to go further,” he said. In addition BTV Ignite, Burlington’s digital city initiative, has worked closely with UVM to support and promote the project. 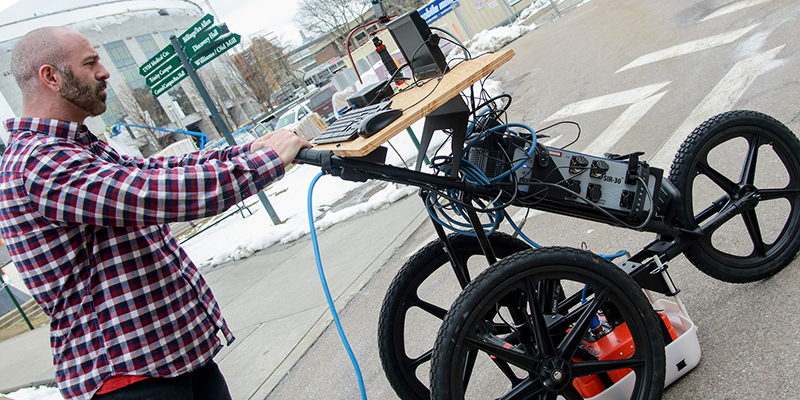 “UVM’s work on underground infrastructure sensing is truly remarkable, and a great example of how Vermont can lead the way on developing 21st century digital innovations," said Dennis Moynihan, executive director of BTV Ignite.